We LOVE this cat! It may seem strange to some of you, but she truly is a member of our family. I have had her since she was a kitten and I was in college. 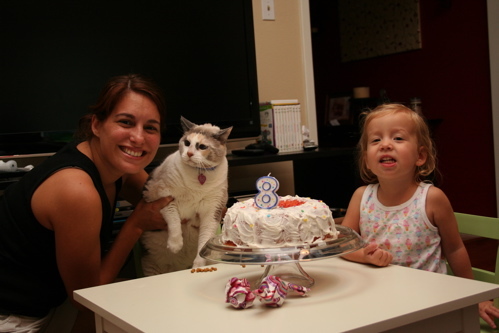 She turned 8 today. How many years is that is cat years? Hopefully not too many. We want to have her around for a long, long time. Emma loves her just as much, if not more, than we do. Even as a baby, any time Emma had a fall or needed some comforting, we were sure Lacey could do the trick. She could be screaming in pain after a fall… and one look at Lacey would bring a smile to her face. It was Lacey who motivated her to reach, crawl, and eventually walk. Lacey and Emma have been best friends for quite a while. Author denissewarshakPosted on July 15, 2008 Categories the mom5 Comments on Happy Birthday, Lacey Pooh! Los Warshaks Create a free website or blog at WordPress.com.